Late Lal Bahadur Basnet was born on 17th December 1926 at Nazitam, Sang in East Sikkim. Born to Lieutenant (Honorary) Prem Bahadur Basnett and Narbada Devi, Lal Bahadur Basnett is an enigmatic personality of Sikkimese politics. 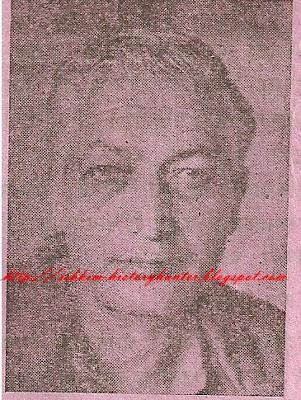 At the age of 4, Late Basnett, along with his parents, left Sikkim for Dehradun (then United Provinces now the Capital of Uttarakhand) and returned to his native land only after 15 years. He got his basic education at Dehradun and went to Ludhiana and admitted to Punjab University for his graduation. After accomplishing his Graduation, in 1945, he went to United Services Pre-Cadet College Belgaum. He was court-martial from the Army due to his direct and open letter to a High ranking Army Officer. In his letter he stated about “the dissatisfaction prevailing in 2/5 Gurkha Rifles”, which was not engrossed by other high ranking Officers. He was sent for a rigorous three months imprisonment but, later released after spending one and a half months in the jail. After resigning from the Indian Army, he went to Pokhara (Nepal) and served as a school teacher. He sat for the Sikkim’s first Civil Service Competitive Examinations and qualified the same and was appointed as a Magistrate in 1961. However, within a short period he resigned from the bureaucracy and joined Sikkim National Congress, a political party headed by L.D Kazi and was entrusted with the charge of Joint Secretary. His ideas of democracy and egalitarianism could not stop there. “The arrest had been occasioned by a series of three articles entitled “Democracy in Sikkim”, published in NOW, a Calcutta Weekly, and a letter written to the Editor, “Hindustan Standard” a Calcutta Daily, on the sensitive subject of Sikkim’s National Anthem”[ii]. “It has come to know that Mr. Basnett had in certain journals and newspaper in Calcutta written articles which have been said to be against the interest of Sikkim. He was arrested under Indian Penal Code Section 124A on the charges of Rajdroha”[iii]. “Now, the ruling house- the Sikkim Durbar- had no intentions to part with its powers and prerogatives which a democratic government would necessarily entail. It restored to the time honoured political weapon of divide and rule....The Sikkim Durbar assiduously applied itself to sowing the seeds of discord among the three communities by playing up the probability of the tyranny of the majority over the minority communities”[iv]. “The Sikkim Durbar has almost reached the point where its absolute rule has become a glaring fact....So, with absolutism in the saddle, Sikkim continues on the dizzy path of eventual chaos”[v]. The only matter that the Durbar had to criticize the writings mentioned above was about the existence of absolutism in the Kingdom, which could be refuted in a usual manner by placing the example of the Executive Council of 1958. However, the arrest of Mr. Basnett gives a clear sketch that how Sikkim Durbar was working on the “democratization” of the country where a single word against the palace was considered as an act of insubordination. “....it would be enough to say that in the history of Sikkim, this is the first case relating to Section 124(A) or treason”[vi]. After spending 48 hours in the police custody, Mr. Basnett was taken before the Chief Magistrate on 12th September 1966, and he was released on bail of Rs 100,000. [vii] On 10th April 1967, after the results of Third General Elections Mr. Basnett was acquitted from the charge of treason. Though, Kanchenjunga [ii] blamed Sikkim National Congress along with other political parties for maintaining silence against the introduction of reservation on the basis of caste and race, it appears that, the Sikkim National Congress had made some clatters. But, as usual their opposition went unheard as the other two parties namely Sikkim National Party and Sikkim State Congress remained hushed and muted and were busy in proving them as good and obedient parties to the Durbar. The photograph attached with this post is a letter from Kazini Eliza Maria of Chakhung to late Mr. Brihaspati Parsai of Namli village East Sikkim. The latter was one of the founding members of Sikkim State Congress founded in December 1947 with a purpose of liquidating feudalism from the very root of Sikkim. It is evident from the letter that late Brihaspati Parsai had invited the Kazi couple for the marriage of their son to his residence at Namli village. However, the Kazini was unable to make her presence with her husband due to ‘ridiculous attitude of Sikkim Durbar’. It is interesting to note that the letter was dispatched from Chakhung House Kalimpong; the unofficial headquarter of Sikkim National Congress. It indicates that the entry of the Kazi couple to Sikkim was banned at that juncture for some unknown reasons and she is hopeful to meet her relations in Sikkim after the riddance of “nonsense”. The line quoted above from Bulletin No. 2 was more than adequate to get exiled in a monarchical set up. However, it materializes that the earlier banishment, indicated in this letter was certainly for raising the voices of the majority, where the Kazi probably was reluctant to accept the Durbar diversion of “divide and rule”. Probably he could sniff the tang of prejudice in the approaches of the palace and remained unbending with his democratic ethos and in all probabilities his democratic values were responsible for ‘ridiculous attitude of Sikkim Durbar’.